The Guardians of Scotland Trust was established as a registered charity in 2013 to improve public education of William Wallace and his often overlooked co-commander, Andrew De Moray, at the Battle of Stirling Bridge. 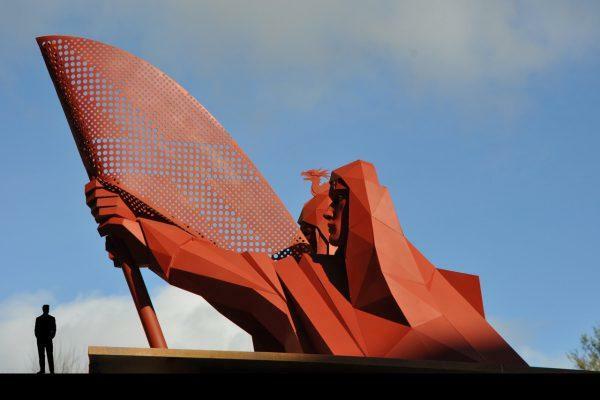 In 2015 they launched an international competition to select an artist to create a new monument to both leaders, to stand on the bank of the River Forth. The short-listed designs were exhibited at the Stirling Smith in 2016. This is the winning entry, by sculptor Malcolm Robertson, who has created site-specific art in the British Isles, Germany, India and the USA. The Stirling Smith opened in 1874, our founder Thomas Stuart Smith, bequest the Smith Institute as a place of learning and a home to his European art collection. Today the renamed Stirling Smith Art Gallery and Museum, still shares its parrions for art but also tells the story of the area and the lives of the people who lived in it.